In his signature motivational voice, Evans interweaves those influential lessons with personal stories from everyday people. He explains that money should not be the preoccupation of our lives. Rather, if we follow the five principles, we will be free to focus on God, family, and relationships -- the true nourishments of life. Wise and compelling, The Five Lessons a Millionaire Taught Me About Life and Wealth will leave you with a new view of what it means to be rich -- and convinced that you, too, can build wealth. 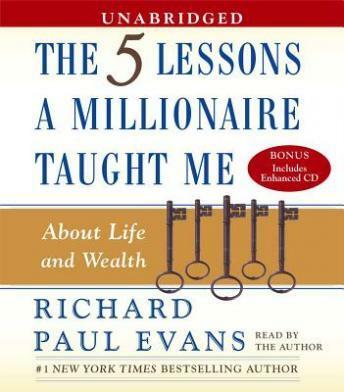 The Five Lessons a Millionaire Taught Me About Life and Wealth is endorsed by financial consultants, churches, schools, and marriage counselors. This book began with lesson 4! After the "end" of book it started at beginning...someone goofed! I listened for awhile... thought that it would probably be really interesting .... There were NO pauses anywhere in the recording. It wasn't my player because the next book I listened to was just fine. I never thought about this before.. pauses are VERY important. I got dizzy trying to listen and absorb what I was trying to listen to. It was read soooooo fast that I just couldn't absorb anything.